Dr. Wynne-Jones has extensive experience on Swahili coastal sites, having completed a research project in the region surrounding nearby Kilwa Kisiwani focusing on issues of urbanism and social identities. More recently, as Assistant Director of the British Institute in Eastern Africa, she directed research at the site of Vumba Kuu, on the southern Kenyan coast. Dr. Wynne-Jones is excavating a sample of houses at the site. Dr. Fleisher has been working in coastal East Africa for 20 years, having directed projects in Tanzania and Kenya. His research interests include the role of rural and non-elite populations in the political economy of small-scale complex societies and the way that people use material culture and space in the establishment and maintenance of social inequality and power. He has had a long-term commitment to Swahili archaeological sites on Pemba Island, Tanzania, where he investigated Swahili towns and villages. Dr. Fleisher directs the exploration of open spaces at the site, focusing on the complex use of public space and its links to performance, daily life, and social memory. Magnetometry and electrical conductivity survey was carried out in 2009 and 2011, with the goal of exploring activities across the site, both inside and outside the town walls. In 2011, this work was extended to Kilwa Kisiwani. Geoarchaeological research includes geochemical sampling across the site, combined with micromorphological sampling of house deposits. Dr. Wood is analyzing beads from all four field season. Phytolith samples have been taken in house deposits and through a sampling program across the open spaces. Dr. Pawlowicz completed a full coverage survey of Songo Mnara Island, in 2013, and will continue this work in 2015. 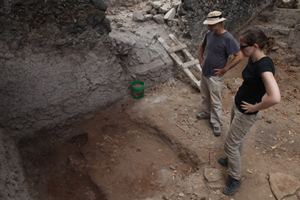 Sediments from all excavations were floated for macrobotanical remains, which are currently under analysis. Faunal analyses are ongoing, focusing on fish (Quintana Morales) and other animals (Prendergast). The site was re-surveyed using a Total Station with EDM in 2009 and 2011. These data are being combined with the results of laser scanning and GPS survey conducted by Prof. Ruther. Intertidal survey at Songo Mnara was carried out in 2011; Dr Pollard is exploring the maritime landscape of the island, building on a background of similar research at Kilwa Kisiwani and along the Tanzanian coast.